“Everybody used to cook the colour, flavour and nutrition out of vegetables. They served grey mush with overcooked lamb.” In the 80’s, this was one of the catch-cries going around the circles of a new breed of better cooks. True. As kids we were regularly served this by families brave enough to have the Jansz clan (parents with 5 pre-teen sons!) over for dinner. Overcooked meat and three veg; the great Aussies staple. We, like Perigord geese, were force fed, although Aunty Norma would regularly find peas and pumpkin under the table after we left. As a child, like every other child, we know peas, pumpkin and a handful of other vegetables were actually poisonous and parents were only feeding them to us in order to collect the insurance money… Check with any 5 year old. The natural over reaction to this by everyone attempting to break free from this particular culinary shackle was to undercook vegetables. Carrots, peas, broccoli, beans and other missiles would fly off the plate rather than be skewered onto our forks. Perfect! We didn’t need to chuck them. So, where to from here? Pretty simple really. There is a general understanding or principal required for you to perfectly cook vegetables according to how they need to be eaten. Quickly cooked and sometimes quickly chilled vegetables (blanched vegetables) will retain or in fact, intensify colour, certain water soluble/heat vulnerable nutrients and a crunch. You may be looking for this when using them in finger foods to, say scoop up dips. Longer cooked vegetables will release their full flavour and will also be able to absorb other flavours (their cellular structure breaks down with cooking). Certain other nutrients will become more accessible too. Now (eventually!) here is one of the best recipe examples of an incredibly, beautifully full flavoured vegetable dish where all the ingredients conspire under gentle long heat to produce an unforgettable and versatile new best friend on the plate. Too much gushing? Well, just try it and who knows, we might just be able to retrieve both our 5 year olds and the carpet under the dining table. Enough for 4 as a generous side serve with a main. 1-2 cloves of garlic, given a crushing thump with the flat of a knife, skin discarded and the very flattened cloves quickly and roughly chopped into little pieces. However bigger pieces are no problem because all pieces have been crushed; the best way to release garlic flavour. Pop the broccoli florets into boiling salted water for about 90 seconds, drain and keep aside. Note, no need to chill in iced water. This method is pretty clever (well done Italy!) because it breaks down the structure of the broccoli a little, sort of ‘opening the pores’ to receive flavour. 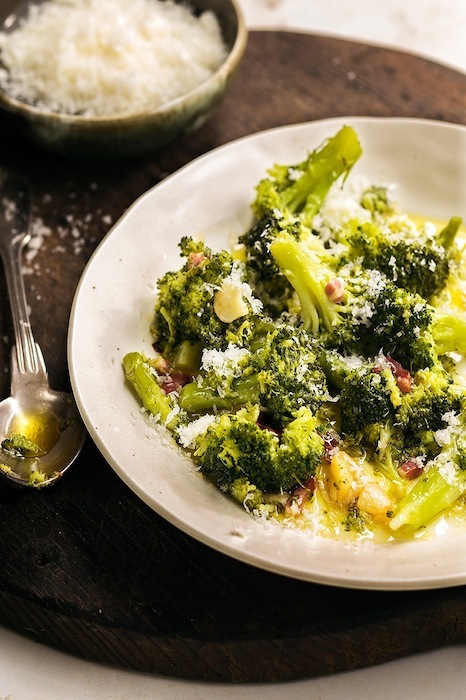 Separately, in a stainless steel pot that nicely fits the broccoli, put in the just crushed garlic, chilli, salt and Extra Virgin Olive oil. Bring, on low heat, to a gentle, barely sizzling point. Do not let brown. Play the heat like a wise angler brings in a fighting fish; give a little line, take back a little line. By this I mean, take the pot with garlic and friends in oil, on and off the heat to keep gently cooking the contents without browning. This will flavour the oil which will ultimately penetrate the broccoli and make the dish work. When the garlic no longer looks raw, say after 3-5 mins of fishing, tip in the barely cooked broccoli and gently fold it around to coat in the flavoured oil. Add a splash of water, 2-3 Tbsp, and with the lid on and also on very low heat let everything come to a steaming point. May take 5 minutes. Do this until the broccoli is very tender when pierced with a knife. Switch off heat and let everything sit for at least 10mins before eating. Talk about eating! Stirred through countless varieties of pasta, either alone or with other ingredients and definitely with grated Parmesan. On a numerous styles of pizza, but especially good with Italian sausage, a little chilli and buffalo mozzarella. As an accompaniment to countless meats. Risottos, soups, and as far as your imagination will go.